Monday is supposed to be my regular posting day. I usually try to do something a little bigger or more involved on Mondays. Today, however, I've got squat. The computer that has all my extra pictures and stuff isn't available to me either. So here's what you get on one of Rantwick's worst Mondays, posting-wise. It is representative of my mental state this morning. I expect to be Back In Tune next time. Give Monday a chance! You've got hours left! You've got a place holder up, but who knows what might happen later? Well don't fret. You stuck your neck out a little to string your readers along. And something could strike a chord before we pick our way to Tuesday. Cafiend... dang, that was good! Dear Rantwick... the pressure, the pressure. Worse than having nuthin, is a head full of ideas when other things must get done, that are eversomuch less fun. The dissonance leaves me completing none. "...a head full of ideas when other things must get done, that are eversomuch less fun..." Wow, Keri. That sounds like my typical work day. And when I get time "off" the brain clutter keeps me from getting anything done unless I really focus on one or two things. It's the predicament of all creative people staying alive with "day jobs." Keep going Cafiend and Keri; there will be something worth reading on this post in no time if you keep it up. So what's new? Many classic Rantwick "Monday" posts are actually on days starting with a T, W, F, or S. All of these end in "day." Cafiend, yup, that totally describes my life. The gerbil wheel of survival is most unkind to us creative types. Steve - What's new is that those are my other Mondays, whereas this is a real Monday. It may not seem so, but I know the difference. Even this post that you had nothing to "post" was fun to read. Done in good taste, as always, Mon Ami! Keri - In an extra piece of irony, one of my first creative escapes from the drudgery of school in the 1960s was a comic book about the unsuspected lives of my gerbils. This was before the word had any connotations of a sick, perverse joke. 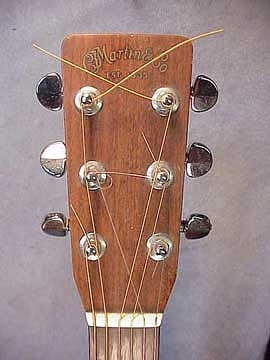 Anon - If I had a Martin, I can guarantee you that it would never ever be treated that way.